Dear Salty Waitress: For the past two years, I have been on a sparking water kick, mostly because it is just like water, only more interesting and substantial due to the carbonation. It has really helped me cut down on my diet soda consumption and random midweek beers with dinner. 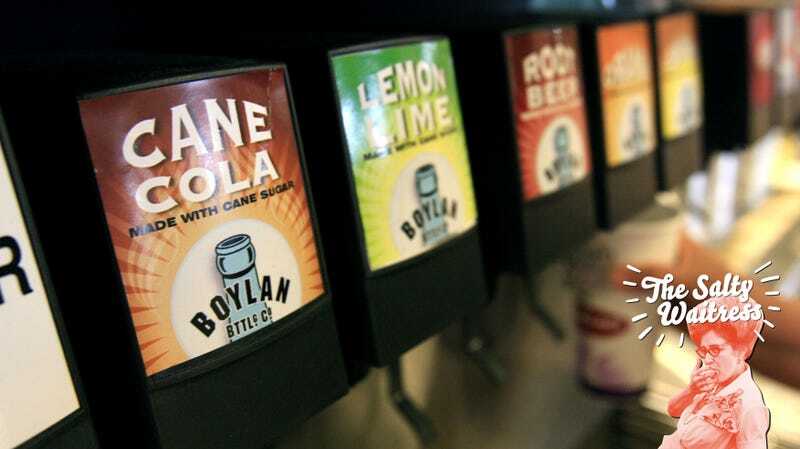 Before discovering my love for flavorless carbonated beverages, I would sometimes ask for a complimentary water cup and then get flat water when out to a restaurant with a self-serve soda fountain. Now, my natural tendency is to go for the unflavored soda water instead. The other day, I was picking up dinner and got a cup of water to hydrate while waiting for my food. I decided to go with soda water and then realized that it may not be cool to use the water cup for soda water since it does take extra work to carbonate it. How do you think the restaurant operators feel about that, knowing that it is bad to use your courtesy cup for free soda? Oh, you expected an actual response? Well hon, let me ask you a few questions: What is it you’re “stealing”? Air? Do you think the restaurant owners mind that you sat for five extra minutes at their booth, using up their free air conditioning? Do they mind that you asked for an extra fork with your to-go order? Are they going to come after you because you used one more square of toilet paper than most people? Fountain soda is a cheap product—you’re just paying for high fructose corn syrup. The reason restaurants don’t want you to fill your free cup with soda is because they want you to buy the damn combo meal or the a la carte soda. Carbonation costs a fraction of a penny, doll. You’re not bringing a business down with your bubbles. Like I said, next question.